There is much debate and confusion over what Eddie Morra (played by Bradley Cooper) said in Mandarin to the Chinese waiter at the end of Limitless (2011). Apparently, Bradley Cooper's Mandarin is largely unintelligible to Mandarin speakers, but after studying many comments online, reviewing Chinese subtitles, and researching Mandarin vocabulary, it is becoming clear that Eddie Morra and the waiter were joking with each other using two plays on words. The problem is--due to cultural differences--people who understand Mandarin probably do not understand the full intent of the humorous exchange, and people who might understand the full intent of the exchange do not understand Mandarin. Of course, the poor Mandarin pronunciations are compounding the misunderstandings dramatically. The result is that no one--seemingly in the entire world--is getting the joke. Eddie Morra: "I will have noodles, two scallion pancakes, and lobster with no MSG (weijing)." Chinese Waiter: "But a scarf (weijin) will protect your clothes." Eddie Morra: "But it won't help with my dirty hands." The first joke here is in the Mandarin pun. The Mandarin word for MSG (weijing) is similar to a Mandarin word for scarf (weijin), which could conceivably be used to describe a lobster bib. (Note: In America, people commonly wear bibs while eating lobsters to protect their clothes from all of the juices that shoot out when cracking open shellfish. 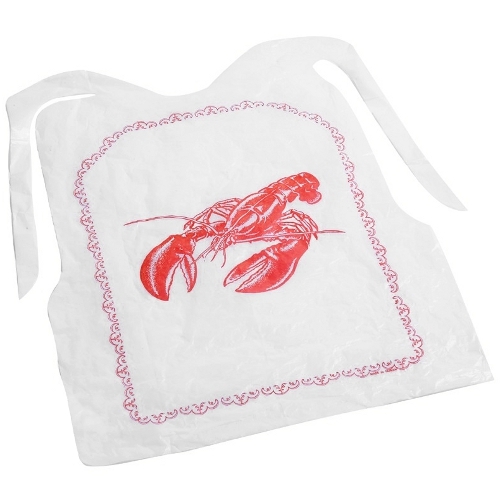 Americans sometimes refuse to wear the lobster bibs, because the bibs look tacky.) When Morra asked to have lobster with no MSG, the waiter joked with him using a play on the words for MSG/scarf (weijing/weijin), explaining he should not refuse the scarf (lobster bib) because it will protect his clothes. Morra then joked the bib will do nothing for his dirty hands. This was a witty response to the waiter, but it has a deeper meaning. "Dirty hands" is a very common expression in English that insinuates one has figuratively gotten one's hands dirty from doing dirty deeds in the past. The irony here is that Morra was about to enter politics, and he had to do some dirty deeds in the past to rise to his level of success. Yes, Morra can eat his expensive dinner and enjoy his wonderful life, but he will be doing so with dirty hands. This joke revealed Morra was happy with his life but was not denying his considerable flaws and unfair advantages. If that is truly what was said between the Chinese waiter and Morra, it was a good note on which to end Limitless. It is very unfortunate the director, Neil Burger, did not force Bradley Cooper to practice speaking Mandarin phonetically until he spoke the words clearly. If properly executed, that final exchange could have been an excellent moment in the movie and a clever conclusion to an interesting plot. By the way, excuse the social commentary here, but Bradley Cooper is being ridiculed extensively for his mispronunciations of Manadrin words. Is it not strange people feel perfectly comfortable attacking Bradley Cooper for botching Mandarin, but making fun of Jet Li's English mispronunciations is considered racist? That is a very odd double standard. Thank you. Your explanation was the best I've found while searching for what Cooper's character said at the end of the movie. I agree, very informative answer...well done. Hi. I'm pretty good at English, yet I am not sure about abbreviation - do you mean "message" by "MSG"? Or what? Do chinise people serve lobsters with messages, alike fortune cookies? No, there are generally no messages included with lobsters in Chinese restaurants. MSG is the abbreviation for monosodium glutamate. MSG is a flavor enhancer used in many Chinese foods. It is common for diners to request MSG be left out of their food because of various health concerns and personal preferences. In America, it would not be unusual for a diner in a Chinese restaurant to request his or her food be prepared with no MSG. I really want to say thank you to you for posting this. I agree with you that people shouldn't talk about his pronunciation. I am Hispanic (Panama), and we don't laugh when people try to speak Spanish or criticize as we know it's not their language. Maybe if they did that part "en español" there would be no criticism. I have studied chinese and i can't understand nothing Eddie says. But i can't also understand why people critize him, he is an actor, and he tried (i hope his best) to speak two sentences in chinese, and that's not easy because the pronunciation is very difficult. Who critizes him, doesn't understand speak chinese, even two sentences, needs more than one weak. I think he seems to speak chinese, and that's enough. I agree this post's author, it is a pity there aren't subtitles to understand the whole meaning of the ending. Thanx for the informations about the end of this movie...! I think the reason why people criticize Bradley Cooper is because , in the movie, he supposedly has taken a pill that makes him incredibly smart and yet his Chinese is so bad that no one can even guess what he's saying. If he were just a man trying to speak Chinese, I don't think anyone would care. Yes, Eddie Morra taking a pill to become brilliant is certainly a key part of the plot and draws further attention to the poorly spoken Mandarin, but the overall tone of the criticism is not directed at the character in the movie. People are directly attacking Bradley Cooper personally, as if he is an idiot for not being able to speak Mandarin or even understand he is not pronouncing words correctly. It is very ethnocentric for a person to hear a foreigner mispronouncing words and then be baffled that the foreigner does not understand he is mispronouncing those words. If a person is unfamiliar with any language, the words sound like a bunch of random utterances. Cooper probably did the scene, had no idea he was mispronouncing words, and probably trusted the Mandarin speakers and others on the set to not let him embarrass himself and weaken the end of the movie. If anyone deserves criticism, it is the director, Neil Burger, or the Mandarin speakers in the production who let the scene go to print. This scene could have been re-shot or Cooper could have re-recorded the dialog in ADR. Bradley Cooper is not the first actor to be criticized for mispronouncing words in other languages. There are many other actors who have been criticized for mispronouncing words in other languages, and they are not even pretending to be geniuses. The point here is that it appears to be totally fine to ridicule a Western actor struggling with an Asian language, but it is deeply offensive to ridicule an Asian actor struggling with a Western language. Why is that glaring double standard okay with so many people? Are these two circumstances not equal? This is an interesting social phenomenon that deserves a little discussion. That's the answer, well done. All of which ignores the fact that Eddie was "Off" the drug at this point in the film. Which should explain, that his mispronunciation is in fact, in line with his character. ie. That while he may know the words, his regular brain was incapable of completely replicating perfect Mandarin tones, without the required practice. Thanks for sharing the info, Editor. My Chinese is okay, but clearly not up to deciphering a play on words. It was, indeed, a great way to end the film. In the film, didn't the Chinese waiter appear to fully understand Eddie Morra's Mandarin lines? I am fully bilingual (in English and Mandarin) growing up in an environment that speaks two languages. And I didn't understand what he was saying. I think the key thing about mandarin is that when you mispronounce it it means something else (like weijin pronounced two ways means two different things here), whereas in English you don't lose the meaning from the mispronunciation as easily. If the pun is based on tones, it won't work if every tone in the sentence is wrong! Also, in Mandarin you don't say ang zang shou to mean dirty hands (that's literal) but rather shou zang (hands dirty) which probably caused much confusion to the Chinese viewers. Hey, just a correction on the explanation of the joke. I didn't notice in the comment of this crucial point so I am posting it here. I know it's a little late, but better late than never right? Like many people you spoke of, I, too, was baffled by what Morra was saying, despite being fully fluent in Mandarin. But I didn't pay it too much heed, simply chalked it up to a poorly delivered line whose cinematic effect was nonetheless present. Anyway, after stumbling upon your post just now (what serendipity! ), I went back and listened to the exchange and understood. Anyway, I'm sorry to say, there is no pun intended in the exchange. Morra was asking for a bib, not MSG, after he ordered the lobster. The waiter was simply providing a light-hearted rejoinder to further continue the exchange, and setting up for the last reply from Morra, which was, I suppose, intended as a joke, whose explanation you correctly stated. In addition to the intended meaning of what Morra was trying to say, which was clearly to ask for a bib, no Mandarin speaker with proper pronunciation would crack a pun on two words that differ in intonation. Most, if not all, such puns you refer to are homonymic, i.e., all aspects of the pronunciation of the word are identical, including the intonation. Well, that was a lot of verbiage for very little purpose. But I just wanted to clarify. I'm italian And I didn't understand what Morra said in The italian restaurant..